Two of the Extraliga's quarterfinal series get underway Thursday, with Mountfield České Budějovice hosting Vítkovice Steel and PSG Zlín hosting Eaton Pardubice. Both series will play their second games in the same locations on Friday, before the other two series start on Saturday. Česke Budějovice. Photo: František Panec, hokejcb.cz. Even though Vítkovice finished third and Mountfield sixth, the series will begin in České Budějovice, as Ostrava's ČEZ Arena is unavailable due to Davis Cup tennis occupying the arena from Thursday to Sunday. The series will shift to Ostrava for games three through five, if necessary, with a possible sixth game going in Budějovice and a seventh back in Ostrava. On one hand, Mountfield is glad to start the series at home, but it also creates some pressure, as after the first two games, they could have to play four of the next five on the road. At 18-4-1-3 on the 3-2-1-0 scale, Vítkovice had the best home record in the league. Mountfield wasn't bad themselves, finishing third at home with 16-4-2-4. Neither team was particularly strong on the road, finishing ninth and tenth, respectively. Therefore, the team from South Bohemia will want to take advantage at the start and win the first two. "We're going to want to put on a good performance and try to win both games at home, although of course our opponent definitely wants at least one win," said coach František Výborný. "Certainly it would be better to start the series in our home rink, but circumstances were against it and we have to accept the way it is. Of the possible options we tried to pick the most acceptable. I don't that it is a handicap nor a key point of the whole series," was Vítkovice coach Mojmir Trličík's take on the unusual series schedule. České Budějovice won the season series, 8 points to 4, taking 3 of the 4 games (one in overtime). Both teams have had 10 days off since their last games. The other series to start Thursday features two teams that were tied with 88 points, Zlín and Pardubice. Zlín won the tiebreaker and got the number four seed based on winning the season series in convincing fashion, 10 points to 2. Pardubice' only 2 points came from an overtime victory. Last year, the two teams tied for second place with 96 points; Zlín won the tiebreaker as well. 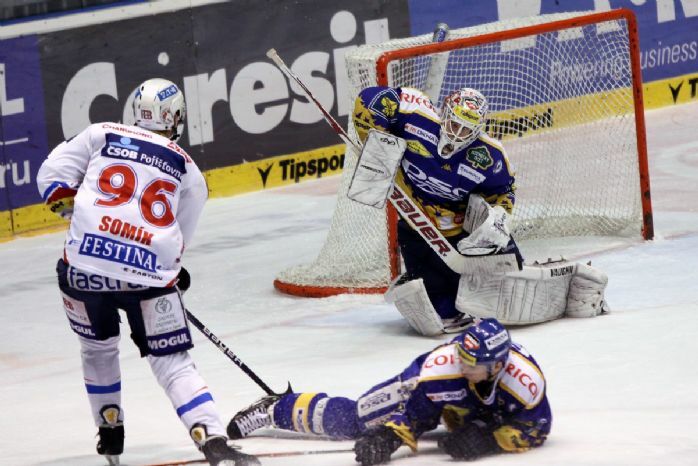 Zlín then lost to Slavia Praha in the quarterfinals, while Pardubice dropped its first game to Oceláři Třinec before winning 12 in a row behind the goaltending of Dominik Hašek to capture the title. This year, Pardubice has no Hašek in goal. However, they do have Martin Růžička, whose great season usurped the expected starter, Adam Svoboda, with 5 shutouts, a 2.11 goals-against average, and a .927 save percentage. For Zlín, Tomáš Duba also had 5 shutouts to go along with 2.25 and .932, so it could provide for a great goaltending duel. According to website hokej.cz, here is the schedule for the first four games of each series, complete with start times and television. Games on ČT4 Sport will also be available online at www.ct24.cz/sport, and most games (though possibly not all) will be available at tv.hokej.cz.